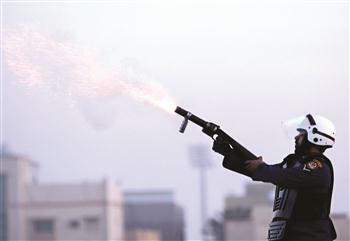 A policeman fires tear gas toward Bahraini anti-government protesters in Sitra, Bahrain, Jan 30. The US decided to sell military equipment to Bahrain. Many Bahrainis were really shocked by the latest news that the Obama administration is going to go ahead with the arms deal with the Bahraini government, especially since the oppression against protesters in several areas in Bahrain has never stopped, if not become more serious. Bahrainis feel that by going ahead with this deal the United States is sending a message to the Bahraini government that they support them on using these weapons against their own people, which has huge implications on how the United States is perceived. The outcome of such a development, if proven right,will result in growing the frustration towards the United States as a superpower which supports its allies even when they are killing their own people. The Bahraini government seems to have gotten this message loud and clear as well. Only days after the news broke, Bahraini police fired tear gas into the cells of protesters who were on hunger strike to protest their detention. the movement is still alive and active either on the streets or on social media. Since the Saudi troops entered the country and cracked down on the protesters last March, it was impossible for tens of thousands of people to gather on the main streets again. However, protesters managed to be creative and find other ways to maintain their visibility. Over the past few months, and since the release of the BICI report, several events have been organized by protesters, such as “Occupy Budayie Road,” which resulted in the arrest of many protesters and the killing of young boys… And many Bahrainis expect serious developments on the first anniversary of the uprising on Feb 14.
in our post 9/11 world there seems to be an inordinate concentration of power by those @ the top, veiled in ominous secrecy.adding to the problem are the mainstream media outlets that,by & large, are asleep @ the wheel,or worse, a propaganda outlet.obama is more poised than his predecessor,but the same end result.